Families have been told to stop bringing helium-filled balloons into railway stations after they were blamed for delays that cost the network £1 million a year. In the latest version of “leaves on the line”, Network Rail said there were 619 “balloon-related incidents” across Britain in the past 12 months. Liverstock farmers don’t like them either, as they fall into fields and get eaten. I don’t like banning things, but surely some regulation and sensible rules are needed. The title of this post is the same as that of an article by Ian Walmsley in the April 2019 Edition of Modern Railways. In the article Ian has a heavyweight go at the Office of Road and Rail about their policy towards third rail electrification. As a Control and Electrical Engineer, I agree with a lot he says, especially as I believe modern control systems and good design can improve safety of third rail systems to a high level. I also believe the following. In some places third-rail electrification, which is only live when a train is protecting the rails from morons, is safer than any other electrification system. In some places, like on top of high viaducts third-rail electrification is safer for engineers installing and maintaining it, than overhead electrification. Some battery charging systems will be designed around third-rail electrification. Ian’s article gives various reasons for using third-rail electrification. He also proposes the radical innovation of using a voltage of 1500 VDC, which he calls 2XV. I like it and agree wit his reasoning.. It sounds radical, but it is not a new idea. An article on Wikipedia is entitled Rail Transport In The Netherlands. Most of the network is electrified at 1.5 kV DC (which limits interoperability with neighbouring countries), although Belgian trains – built for 3 kV DC – can run on the Dutch network at reduced power. Both the HSL-Zuid and the Betuweroute have been electrified at 25 kV AC; although conversion of existing electrified lines to 25 kV AC was considered in 1997, 2005 and 2012 at a cost of over €10 billion, a 2015 proposal (revised in 2017) is to convert to 3 kV DC at a 2017 cost of €1 billion. The higher DC voltage would reduce power losses and have faster acceleration above 60 to 70 kilometres per hour (37 to 43 mph), so stopping trains would save seven to 20 seconds per stop. Are the Dutch implementing their proposal? I have now taken Eurostar to Hamburg twice, with a change at Amsterdam Centraal. The first time, I took two German Inter City trains, with a change at Osnabruck. I wrote about it in From Amsterdam To Hamburg The Hard Way. On my latest trip, I took the following route. There are no direct trains between Amsterdam Centraal and Groningen. Most involve a quick interchange at Almere or Utrecht. Amsterdam Centraal to Groningen is electrified. Amsterdam Centraal to Groningen takes two hours six minutes on the fastest train. When the bridge over the Ems is rebuilt, there should be an hourly train between Groningen and Leer, rather than a two-hourly bus. Leer to Bremen is electrified and takes under an hour and a half. I took a roundabout route from Bremen and Hamburg, as I wanted to check that the hydrogen-powered trains were running. There are direct trains between Bremen and Hamburg. Could The Slower Route Be Improved? The Dutch probably planned the timetable before Eurostar served Amsterdam. There are new Dutch InterCity trains on order for other routes. A direct service between Amsterdam Centraal and Groningen could probably be under two hours, with perhaps two stops. On my trip, the trains trundled along at 50-60 mph, which isn’t very fast. For these reasons, I would rate it highly lightly that the Dutch will think about a direct service. Without doubt, the problem on this section is the bridge over the Ems. The mainly single-track railway without electrification between Groningen and Ihrhove near Leer is about seventy kilometres. After the bridge is rebuilt, one of Arriva’s Stadler GTWs could do the journey in perhaps 30-35 minutes. A bi-mode Stadler Flirt, like one of Greater Anglia’s Class 755 trains, which have a top speed of 100 mph and bags of grunt could probably break the half-hour. Some web sites put the opening of the new bridge in 2024. I’m reasonably certain, that by that date, an electric train with these power systems would be able to handle the route. Bombardier and Stadler are certainly aiming to have battery-powered trains in service by the bridge opening date. This electrified double-track section has the following timings. There doesn’t appear to be any major improvements needed. How do the fastest times on the two routes compare? This is the only route available and the fastest times are something like. It appears that most services go to both Bremen and Hamburg. Every time, I’ve changed at Osnabruck, the second train has been late. I would estimate the best fastest times are something like. I am very surprised that the route via Groningen could appear to be over an hour faster. At present, this service would not be possible, because of the bridge over the Ems. The route has the following characteristics. Dutch electrification at 1.5 KVDC between Amsterdam Centraal and Groningen. No electrification from Groningen between Groningen and Ihrhove, which is seventy kilometres. There are several trains that can handle both electrification systems at the two ends of the route, it’s just the seventy kilometres in the middle. In my view there are several ways to bridge the gap. The Dutch or the Germans can probably electrify the line on time and on budget better than we could. But which electrification system would be used? Using a dual-mode bi-mode train, that could also run on diesel would be a possibility and I’m sure that Bombardier, Hitachi and Stadler could supply a more or less off-the-the-shelf train, that could run at up to 200 kph where possible and handle the section without electrification on diesel. But using diesel in an area developing a green economy based on wind power and hydrogen, is probably not a good marketing idea. If diesel can handle the route, I’m certain that hydrogen could be used on the section without electrification. The section without electrification is only seventy kilometres and in a few years time will be totally in range of a battery train, that charged the batteries on the end sections. Power changeover could be arranged in Leer and Groningen stations if this was thought to be more reliable. Note that in Hitachi Plans To Run ScotRail Class 385 EMUs Beyond The Wires, I write that Hitachi are claiming a battery range of sixty miles or a hundred kilometres with a Class 385 train with batteries in a few years time. Hitachi won’t be the only train manufacturer with the technology to build a suitable product. I have to conclude that Groningen and Leer is a classic application for battery power. Obviously, the Dutch and the Germans, should know their market and would know where the trains should stop. Having experienced the route in the last few days, the following stops could be possible. But with modern trains, that have a minimum dwell time at stations, there may be more stops than some might think. Which Company Would Run The Service? I don’t know anything about the complications of running international trains, even when they are totally in the Schengen Zone. In the UK, Amsterdam to Hamburg is the sort of service that would be proposed by a well-funded Open Access Operator. The company, who would benefit most from this service is Eurostar. So could we see Eurostar operating or sponsoring Open Access feeder services in Europe, using say 200 kph trains? It would appear that the following journey times are possible. For this to be possible the following is needed. The bridge over the Ems is rebuilt. Battery power works as its developers hope it will. How many other routes in the world, would benefit from a similar philosophy? Could Hull Become A Tram-Train Terminal? Hull Paragon station is a station on the edge of the City Centre. On Wednesday, I arrived at the station on a train from Bridlington and was very hungry. I also needed a drink, so that I could take my medication. Like most of the East Cost of England from Newcastle to Felixstowe, there is a shortage of gluten-free food in the stations. So Hull joins a big club including Clacton, Felixstowe, Great Yarmouth, Ipswich, Lowestoft and Middlesbrough. Asking in the station, I found there was a Marks and Spencer in the City Centre, that was about a twenty minute walk. So I walked it and luckily got the last gluten-free egg sandwich in East Yorkshire. This map shows the City Centre of Hull and its relationship to the station. The station is in the top-left hand corner and most of the shops, galleries and other buildings are in the middle. You will also notice, that there is no small amount of space and quite a bit of water. These pictures show the City Centre. From what I have seen in other cities on the Continent, I think that a tram loop could be created in the city. Tram-trains would be used, as they would need to run on both a tram network and National Rail tracks. Tram-trains would arrive at an inbound platform in Hull station from the West and North. They would stop in the station, so that passengers could change to and from buses and long distance trains. They would then go through the station and take to a loop around the City Centre. After stopping at perhaps half-a-dozen places, the tram-trains would reenter the station and stop in the outbound platform, before leaving the station. I don’t know Hull or the travel habits of Hullensians, that well but these are a few thoughts. These would probably be similar to the Cardiff variant of the Class 399 tram-trains used in Sheffield’s tram-train extension to Rotherham. The Cardiff tram-trains will be fitted with batteries to allow for a certain amount of catenary-free street running. I’m sure battery power would cope with the steepest hills in Hull City Centre. Loops like this are not very common in the UK, but there are two successful examples. The Heathrow Loop on the Piccadilly Line. There were also numerous loops for merry-go-round trains, that used to deliver coal; to power stations. 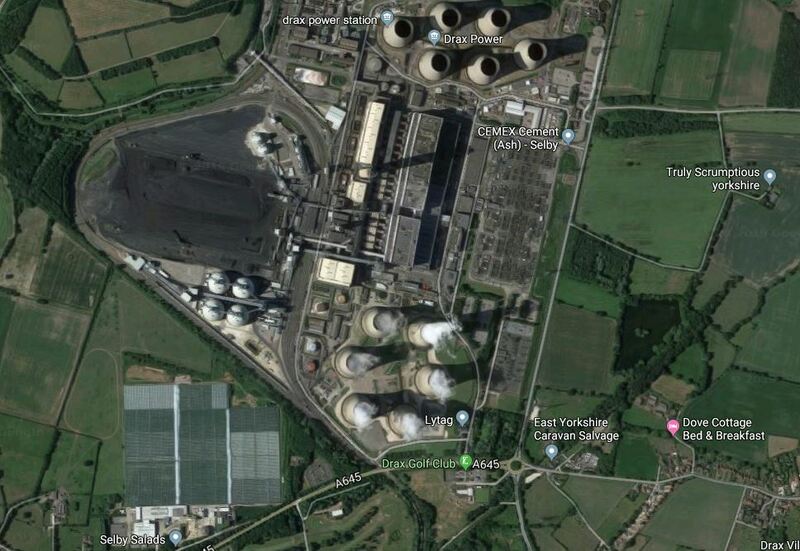 This Google Map shows the enormous Drax power station, which has a capacity of nearly 4 GW. The loop on the West side, which trains use to deliver the biomass, that is now the main fuel for the station. Below the loop , there are extensive greenhouses, which use waste heat and carbon dioxide from the power station to grow salads. There is also a plant that makes building blocks from the waste ash on the site. Power station do a lot more than just generate electricity. The track needs is very simple and often single-track. Signalling only needs to work in one direction. They can handle a large number of trains. 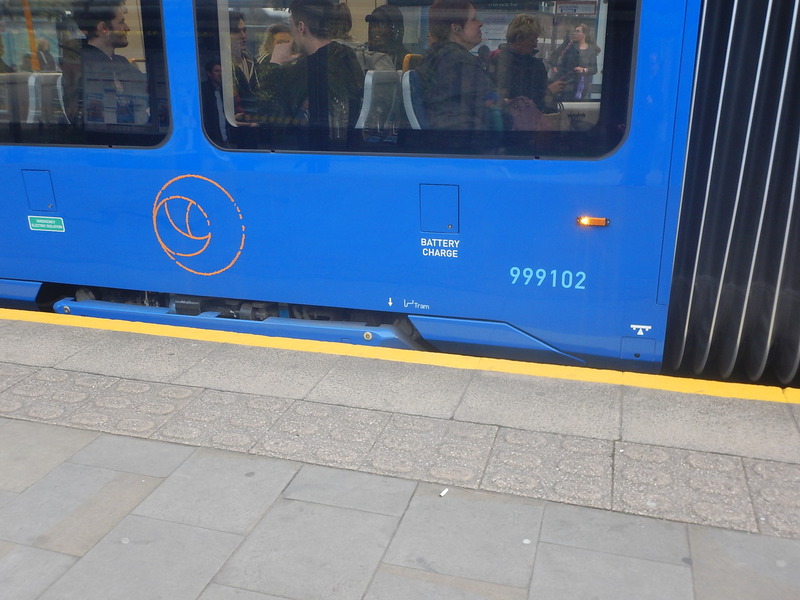 Loops are particularly suited to trams, as they can have tight turning circles. Hull needs an economic boost and I believe that i the next ten years, the route between Hull and the East Coast Main Line will at least be partially-electrified. The distance between Hull and Selby by rail is thirty-one miles. It runs across fairly flat country. The main problem would be the historic Selby swing bridge. From my hrlicopter, it doesn’t look to be the most difficult line to electrify. Partial-electrification with dead sections on the swing bridge and under any low bridges would be a solution. But it would need trains to be bi-mode or have battery power to jump the gaps. Hull Trains and First TransPennine wouldn’t object. Where Will The Tram Trains Go From Hull? The largest tram-train network in the world is the the Karlruhe Stadtbahn. The longest route is S4, which goes all the way to Öhringen, which is a distance of over fifty miles from Karlsruhe. The lines are electrified, but technology moves on and ranges of fifty miles on batteries are being predicted by those who are designing trains, trams and tram-trains. Distances and times from Hull include. Note how slow the services are. Are they timed for Pacers? I could see a two route strategy being developed. 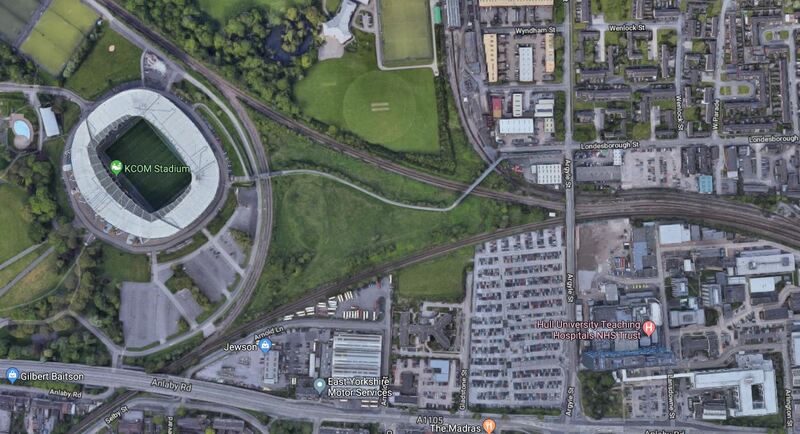 This Google Map shows the KCOM Stadium which is about a mile out of Hull station. The rail lines are as follows. The line going North West goes to Beverley, Bridlington and Scarborough. The line going South West goes to Brough, Goole, Selby and Doncaster. The line going East goes to Hull station. It should also be noted that in the South East corner of the map, part of Hull Hospital can be seen. My initial plan would start by electrification of the line between Hull and Selby. Hull Trains to run their Class 802 trains between London and Hull on electric power. Desel power would still be needed between Hull and Beverley for one train per day in each direction. First TransPennine to run their Class 802 trains between Liverpool and Hull on electric power. Diesel power would still be needed between Manchester and Selby. Class 399 tram/trains could operate on the electrification between Hull and Selby. Class 399 tram/trains could replenish their batteries using the electrification. Fully-charged battery tram-trains would then have free-reign to explore, on any suitable track. They could go walkabout in Hull City Centre to set down and pick up passengers. They could run a second service to Beverley or Driffield on battery power. They could run a third service to Goole on battery power from Gilberdyck. Extra stops could be added at important locations, like the Hull Hospital and the KC Stadium. Could there be a network with three routes. Some things ease getting a good route structure. Known traffic patterns might show where to add extra stops. There are two disused platforms at Brough station. Brodlington has a convenient bay platform. There are no closed stations between Hull and Berverley, Brough and Goole. Beverley and Goole stations don’t look to be good terminals. I’m sure a good route structure can be created. Ideally all branches should have four trains per hour (tph) for a Turn-Up-And-Go service. A reasonable two tram-trains per hour to Beverley, Brough and Goole, would produce the following services. A six tph frequency through the City Centre. Hull station, Hull Hospital and the KCom Stadium would have six tph service in both directions. Because two routes go via Brough, all stations to Brough, would have a four tph service both directions. All stations to Beverley or Bridlington would have a two tph service in both directions. All services would be augmented by limited stop services from Hull to Doncaster, Leeds, London, Scarborough, Sheffield and York. The following works would need to be done. Electrify Hull to Selby with 25 KVAC overhead wires. Build the tram-train loop in Hull City Centre. Adjust platforms, so that they can provide at least good access between all tram-trains, trains and platforms. Hopefully, this will be enough to allow the tram-trains to start operating. How Many Tram-Trains Would Be Needed? My rough calculations show that a full service could be provided by between eight and ten tram-trains. The variation is because, the performance of the tram-trains will affect the numbers required. I have only roughly sketched how a tram-train network based on a loop round Hull City Centre could be developed. In my view for it to be viable, the first thing, that needs to be done is to electrify between Hull and Selby. The title of this post is the same as that of this article on Rail News. Electrification of the Midland Main Line is set to be extended from Kettering North Junction to Market Harborough station. The project was announced in the House of Commons and has already been called great news by the local MP. In MML Wires Could Reach Market Harborough, I laid out my thoughts after an article in the June 2018 Edition of Modern Railways, with the same title. This was my major conclusion. I think that electrification between Glendon Junction and Market Harborough station will happen. I actually feel that with the announcement of innovative new rolling stock and electrification methods in the last few months, that electrification of this section could now be easier and that electrification to Leicester might even happen. There has been an electrical failure on the Gospel Oak To Barking Line this morning. So the service has been run by three Class 172 trains, working alone! After all the fuss about losing the Class 172 trains in a couple of weeks, the worst happens in another way! If it’s the electrification, Network Rail must get it better! The following two services were started from Wigan North Western station in May 2018. Alderley Edge via Manchester Piccadilly. Both services are hourly and cross-Manchester services. I rode both of them on Friday afternoon. These two routes are not fully-electrified and it was intended that they would use new Class 769 bi-mode trains, which can use diesel on sections without electrification. But the Class 769 trains are still under test, so there was a selection of good and not-so-good rolling stock. One four-car train was two refurbished Class 156 trains working together. Another was a pair of refurbished Class 150 trains. And a third was a Class 150 train pulling a Pacer. The diesel trains trundled into Manchester at speeds between sixty and eighty mph. At least the four-car trains were the right size for the route and although full, the trains weren’t by any means over-full! The arrival of the Class 769 trains would increase the quality and operating speed of the rolling stock. I also went into Manchester on Saturday in a Class 319 train. This electric train was doing up to ninety mph on the fully-electrified route via Newton-le-Willows. As the Class 769 trains are based on Class 319 trains on electrified sections of the routes, they will be able to speed along and shorten journey times. On this route approximately 9.5 miles of the 34.5 miles route is not electrified and journeys take 78 minutes. As between Bolton and Alderley Edge is now fully electrified, I wonder what will be time between Wigan North Western and Alderley Edge. If the service is under the hour, this could mean a reduction in the number of trains needed to work the route. On this route approximately 17 miles of the 27.8 miles route is not electrified and journeys take 59 minutes. Because this service spends more time on diesel, the speed-up might not be as easy to achieve. I predict that the Class 769 trains will be welcomed by passengers, operators and staff, as they will speed up services. I took these pictures as I changed trains at Bolton station. According to this article on Rail News, which is entitled Final Test Train Runs On Electrified Preston Line, the Manchester-Preston line has passed all the tests to allow Class 319 trains to run at 100 mph. They also hope, that 100 mph running will start in May.